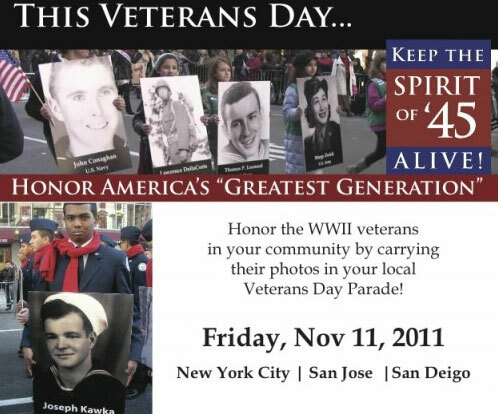 Keep the Spirit of ’45 Alive will be highly visibly on November 11 as hundreds of youth and adult volunteers march with photos of World War II veterans in the Veterans Day parades across the country as they pledge to honor their legacy of service by helping build a better America. More than 100 Boy Scouts, Girl Scouts and Air Force Jr. ROTC represented Spirit of ’45 in the 2010 “Nation’s Veterans Day Parade” in New York City wearing bright red scarves as they marched in America’s largest Veterans Day parade in front of a float carrying our National Spokesman Jerry Coleman and a 6 ft replica of the famous Times Square Kiss. Jerry was invited to be the Grand Marshal for last year’s Nation’s Parade in recognition of his 120 missions as a Marine fighter pilot during World War II and the Korean War, for which he received two Distinguished Flying Crosses. Jerry was the only major league baseball player to see combat in both wars, sacrificing 5 years of his career to serve his country, and received a warm welcome from New Yorkers who remember him as the MVP of the 1950 World Series Champion Yankees. This year, approximately 20,000 people will march in the NYC Parade which attracts over 500,000 spectators who line the 30-block route up 5th Avenue, and was will be televised by Fox live in the New York Metro area. Spirit of ’45 groups marched in parades in other cities, including Jerry’s home town of San Diego, Silicon Valley/San Jose, and Coeur D’Alene, Idaho, birthplace of another famous WWII Marine aviator, Pappy “Black Sheep” Boynton. 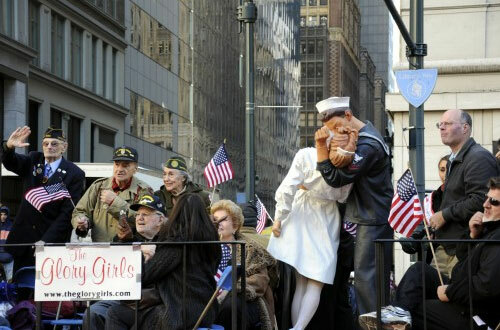 A 6 ft version of the 25 ft Seward Johnson sculpture inspired by the "Times Square Kiss" of August 14, 1945, on the Spirit of '45 float in the NYC Veterans Day Parade. More than 200 youth are expected to march in the San Jose Veterans Day Parade this year which will have its own “Time Square Kiss” on display. 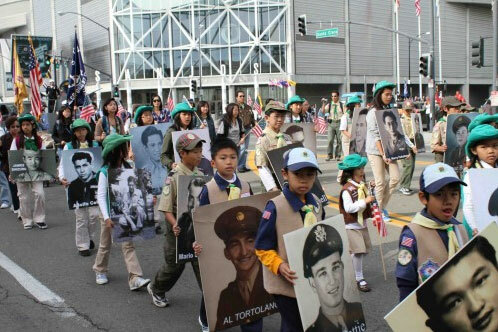 The idea of having youth carry poster size photos of WWII veterans from their local community in parades and patriotic events originated in Silicon Valley as part of the Stories of Service project. The Spirit of ’45 entry in Silicon Valley is organized each year by Debbie Porras who has been actively involved in Scouting for many years. 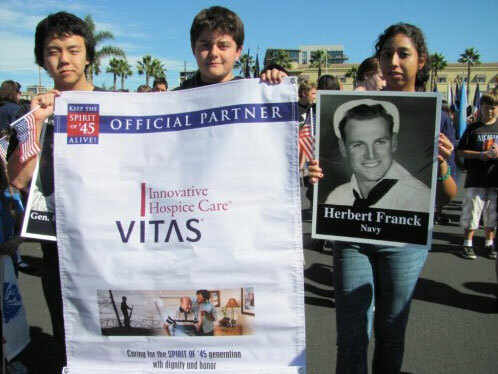 With the success of this year’ effort, we will be encouraging others to join us next year to help mobilize thousands of youth to march with images of their community’s WWII veterans in their local Veterans Day Parades next year as we set yet another new national tradition to honor service and keep the Spirit of ’45 alive throughout America!